Wet Macular Degeneration Treatment - What Are Your Treatment Options? Wet macular degeneration treatment options are helping people to restore lost vision or to stabilize it through anti-VEGF injections into the eye and thanks to research new treatment possibilities may be just around the corner. If you've been diagnosed with wet AMD it is important that you find a retina specialist to find out your treatment options. He/she is an ophthalmologist that has special training in diseases of the retina such as macular degeneration. Treatment for wet macular degeneration may possibly restore some lost vision but it is also used to prevent or delay further loss of vision. The goal of most wet macular degeneration treatments is to stop any further bleeding in the macula . This is so important because when these immature blood vessels leak, they permanently damage the photoreceptor cells . Can this retinal condition be reversed with wet macular degeneration treatment? Sometimes. Many people do notice an improvement in their vision. Usually the goal is to stop or slow the progression of this disease. Anti-VEGF drugs is a macular degeneration medication that blocks VEGF - vascular endothelial growth factor. This factor promotes the development of the leaky, immature blood vessels. So the anti-VEGF inhibits the growth of new blood vessels. You may also see these medications called anti-angiogenic. They are given by injections directly into the eye. Macugen was the first FDA approved anti-angiogenic medicine. It has been replaced by newer anti-VEGF medications that are also given by injection into the eye. Lucentis was the second FDA approved drug that inhibits blood vessel growth and is also given by injection into the eye. Avastin is an anti-angiogenic medicine that is being used as an off-label drug choice. Anti-angiogenic simply means to reduce the growth or development of blood vessels. It is less expensive than Lucentis but has not yet been approved by the FDA as a replacement for Lucentis. 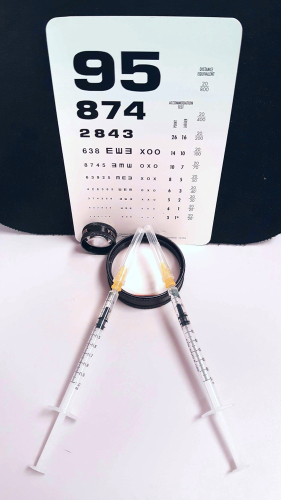 "The recommended dose for EYLEA is 2 mg administered by intravitreal injection every 4 weeks (monthly) for the first 12 weeks (3 months), followed by 2 mg once every 8 weeks (2 months)." This means it is given less frequently - which means less trips to the eye doctor and less money coming out of your pocket. Visudyne medication or photodynamic therapy (PDT) uses a laser after a person has been injected with a light-sensitive medicine called verteporfin or visudyne medication. It works by destroying abnormal blood vessels in the retina and may help slow the progression of wet macular degeneration. Surgery using the iolAMD lens, also known as the Hubble Implant, is even less invasive than most cataract surgeries. Using a 3 mm micro-incision each eye receives a iolAMD implant once the old lens has been removed. A telescopic effect is achieved by using the two lenses with a magnification of 1.3x. Patients are finding their vision improves to the point that some can drive again and others can recognize faces and enjoy reading. Laser photocoagulation uses a hot laser to seal leaking blood vessels. At one time it was the only available wet macular degeneration treatment. This treatment is rarely used for AMD since it causes a permanent scar and visual blind spot where the eye was treated with the laser. However there are some circumstances when it still may be considered a viable option depending on where the leaking blood vessels are located in relation to the macula. What if there was a one time treatment that was noninvasive, painless and reduced the number of anti-VEGF injections needed to inhibit the growth of leaking blood vessels? The INTREPID study enrolled 230 participants who had wet macular degeneration over the age of 50 and who were diagnosed with wet AMD within the last 3 years. MicroPulse Laser Therapy is a new type of therapy that uses short pulses of heat that allow retinal tissue to cool between pulses of energy. This more controlled way of administering laser means that retinal tissue damage is prevented or minimized. Acupuncture is a method of using fine needles to stimulate invisible lines of energy or Qi (pronounced "chee") running beneath the surface of the skin. The acupuncturist inserts needles into particular points on the energy channels to correct the flow of Qi and so affect change in a part or function of the body. Microcurrent stimulation delivers low-intensity electricity to the eye area with the idea that it will improve circulation to the retina providing it with vital nutrients and assisting in the removal of harmful wast products. All the studies for wet AMD can be found in one place - at the National Institute of Health's website (www.clinicaltrials.gov). There are several exciting studies going on like combining Lucentis injections with radiation or comparing the effectiveness of Lucentis to Avastin. Johns Hopkins in Baltimore is one of the study sights for a Phase I clinical trial looking at the safety of using a virus to transfer a gene into the eye. It involves a single injection into the eye. Gene therapy works by delivering a normal copy of a defective gene via vectors, which are usually a virus. The virus transfers the gene to the retinal cell. Unlike the rest of the body, retinal cells don't turn over - they last a life time. The new, healthy gene tells the cells to make a new protein.